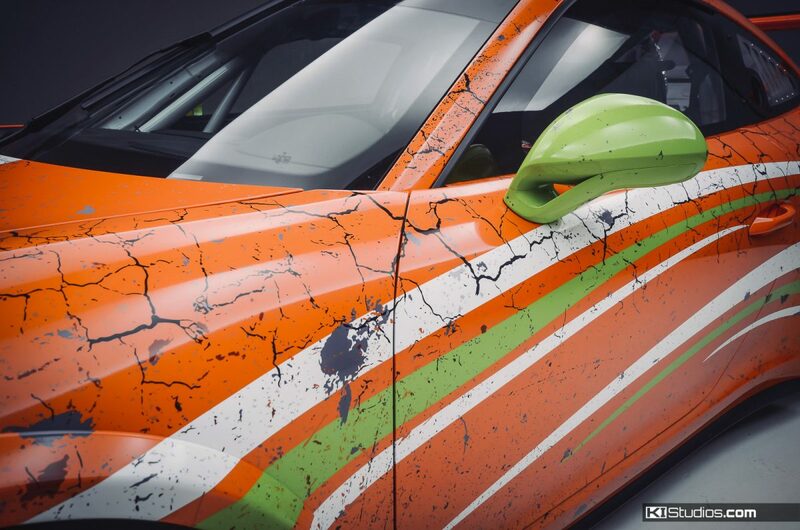 Distressed racing wraps are very unique and definitely garner a lot of attention. Your eye is trained subconsciously to associate things a certain way. 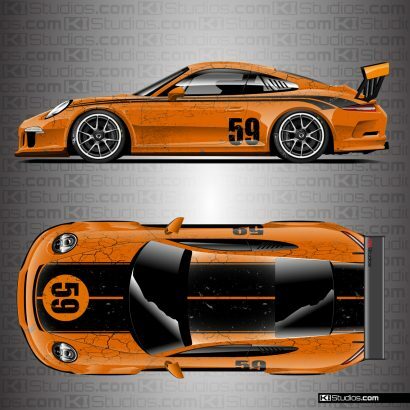 For example, if you see a newer style Porsche, such as a 991 GT3 RS, you immediately recognize it as a new car. Your brain expects a flawless finish. Even if the car happens to have a scratch, some tire chunk marks on the paint, or may have scraped the K-wall at the track, the overall look of the car still carries that new car look. If said car has graphics, a livery or just racing stripes, the nearly complete image of this Porsche is that of shiny perfection. Now, if you take this same Porsche and you wrap it in a livery designed to look like the car has been out for a decade of hard racing in combination with some really cool shapes and colors you are bound to be noticed. You would think that a dirty, weathered look would just look ugly. You know, like some old Honda Civic or something. But no; the opposite is true. That’s where the trained eye comment above comes into play. Car guys recognize a shape immediately. That sleek new body hidden under a grungy racing livery will look amazing, because it’s so dramatically different from what you’d expect to see. Imagine it as instant patina on a brand new car that allows you to easily revert back to the brand new look whenever you would like. When you combine nostalgic racing artwork with a distressed finish, the fun gets even better. The key is to know how to properly design a distressed car wrap. You want it to look authentic. For this you need just the right type of grunge and the correct amount of it. The design must have different types of wear in just the right places. For example: You want cracking paint over some horizontal surfaces, long stain marks behind the wheel wells to simulate hot rubber being flung at the paint. 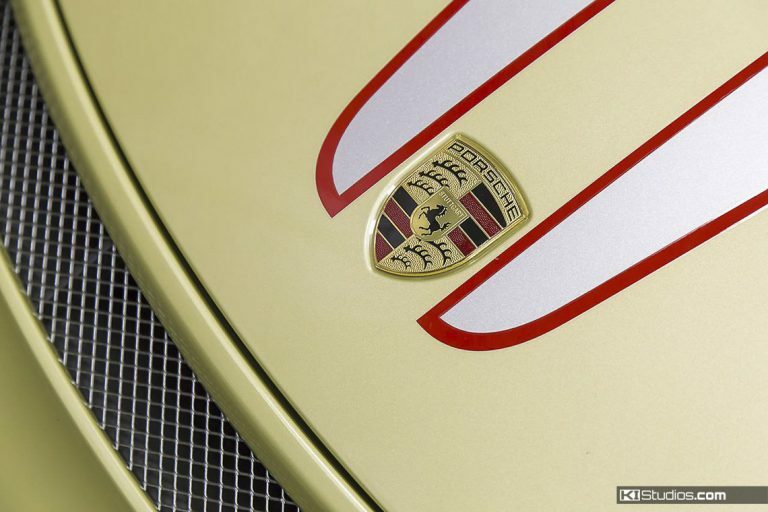 Exaggerating common areas that get rock chips, with even more rock chips, such as the front of the rear fenders on Porsches can make for a dramatic look. The idea is that the car looks like it has years of racing heritage behind it rather than just some random scratches. All this weathered look must be done in such a way that it looks realistic. This is something that our experienced designers do here at KI Studios. We can take your brand new Porsche or super car and give it the veteran racer look. It’s like a Gibson custom shop weathered Les Paul guitar. You really need to know what you’re doing so that it looks realistic. The added dramatic effect of this style over a new car is one of the most fun aspects of grunge racing wraps. Now, here’s the best part. You can achieve this look, with a certain level of personalized customization without having to pay a designer to do it! This sort of design can take hours upon hours of work and gets really expensive. Yes, we can do a fully custom design for you in this way for a reasonable price. However, with our predesigned offerings from our online shop, you can achieve this look with no design fee and still be different. Currently we offer a number of racing liveries in our online store. 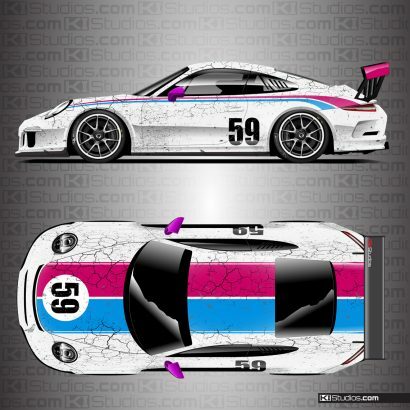 Some of these designs are distressed racing liveries. With most of these you get to choose you own unique color combination. Some of these designs allow up to 3 different color location choices within the same wrap. For each of those locations, you get 6 or more different color choices. When you put them all together you end up with a unique and very special design that no one else has. These kits are not sold in large quantities, so the chances of someone selecting the exact same design and color combination as you are extremely low. With this program you only pay for the actual printed wrap. There is no design fee which can oftentimes really add up when you weigh it in with the entire project. We then print the design, laminate it in your choice of gloss or matte, and ship it to you. You then hire a local wrap shop to install it for you. 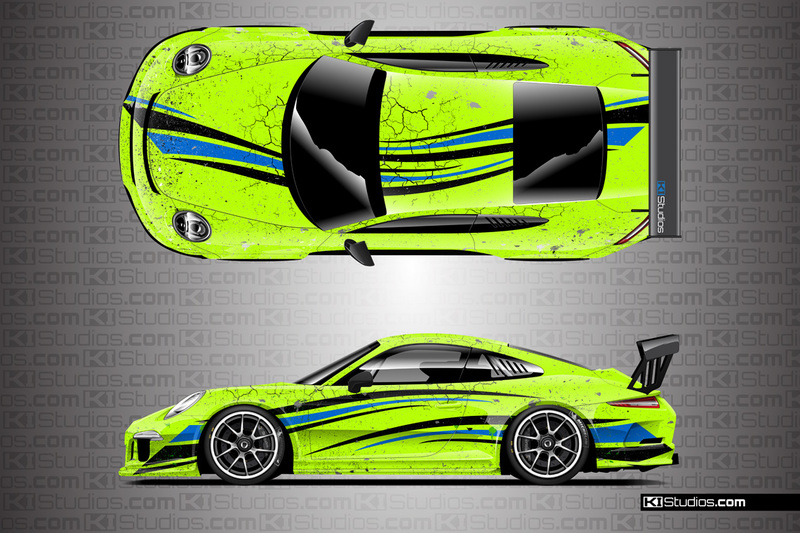 Our most recent distressed livery options include a Brumos Porsche style wrap with grunge in just the right places, across the entire wrap. We call this design “War Horse.” With this offering you can even choose to include printed racing numbers to match the wrap. Alternatively, you could just skip the numbers altogether and apply you own event numbers later. 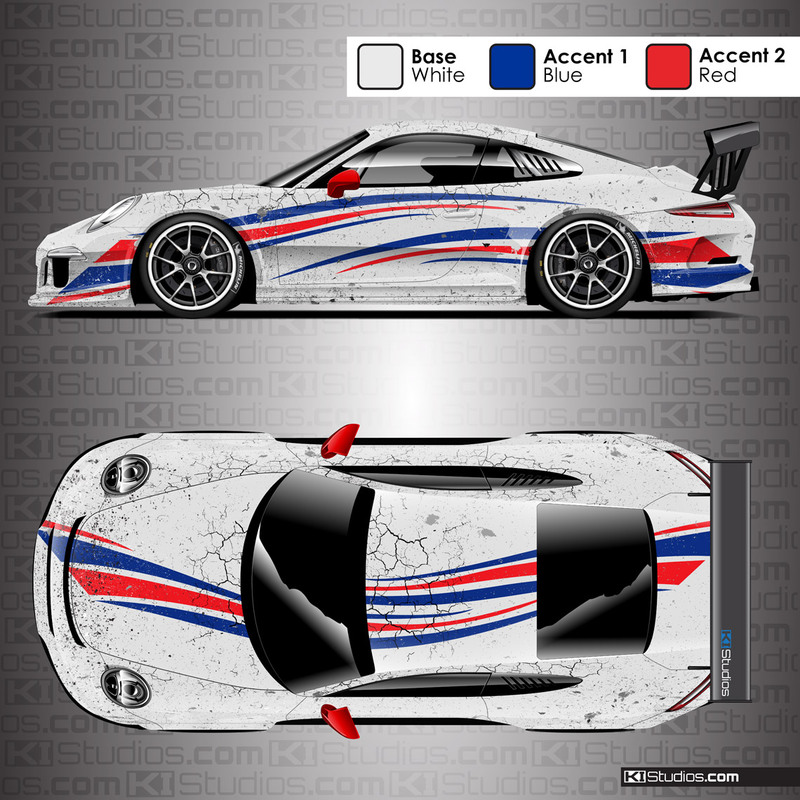 Given this design is based on historic racing livery, the default design is based on the same red, white and blue classic colors. However, that’s where the similarities end. You can customize those colors to be whatever combination you’d like, You’re not even limited to a white base. 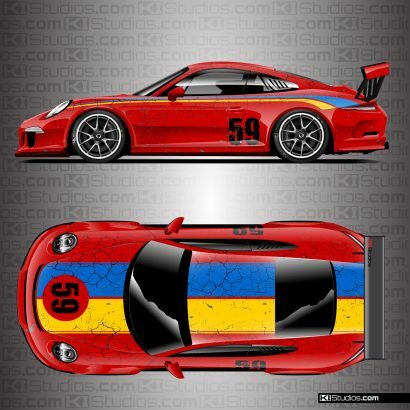 Imagine Brumos Porsche stripes over a yellow car. Or imagine those same stripes but purple and lime green. You get the picture. You can create your very own unique design combination. 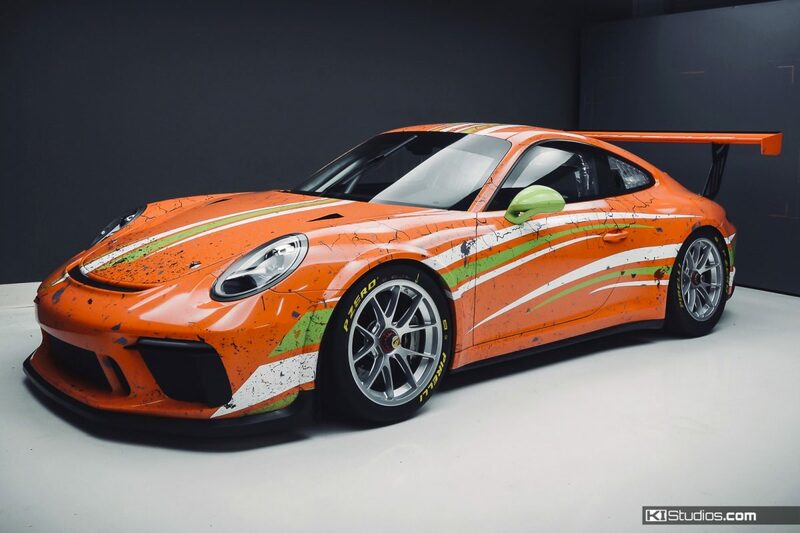 We also launched a new and very exciting grunge car wrap that we call “Arid.” This design is not based on a classic livery, but rather on a more modern design language that follows the look of some more contemporary Porsche Cup cars. We then add an original grunge effect throughout. This particular design features a more weathered look throughout than the War Horse design. However, the War Horse design does have more weathering along the wheel wells to simulate rubber and rock chips in a more aggressive manner. This design also allows for 3 different colors choice locations. You can choose any base color you like and then choose the colors for the two accents. 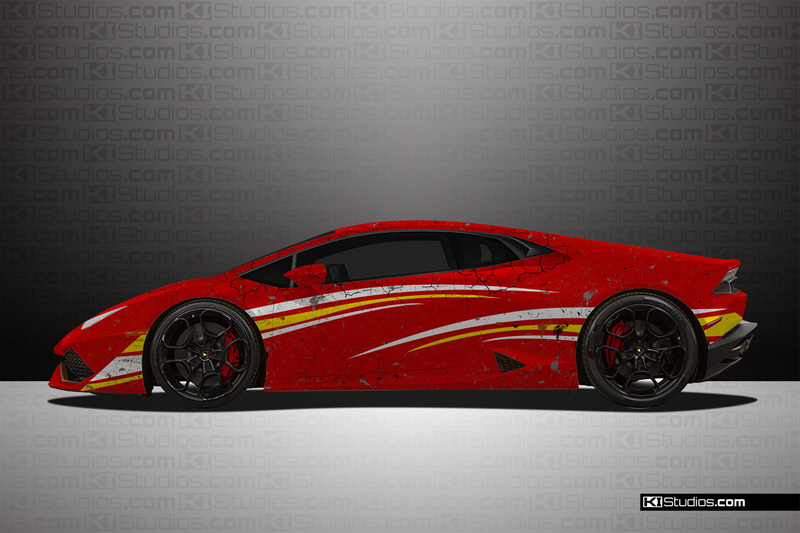 For either design, you can opt for KI Studios Racing Numbers. These numbers can either be placed semi-permanently on the wrap or you may also opt for reusable numbers that can be removed and used later. Drive a piece of modern history today! You will love the unique and intricate look of these designs. It’s instant patina without the permanent commitment. Not only that, but your car will stand out from the rest at the track like it never has before.